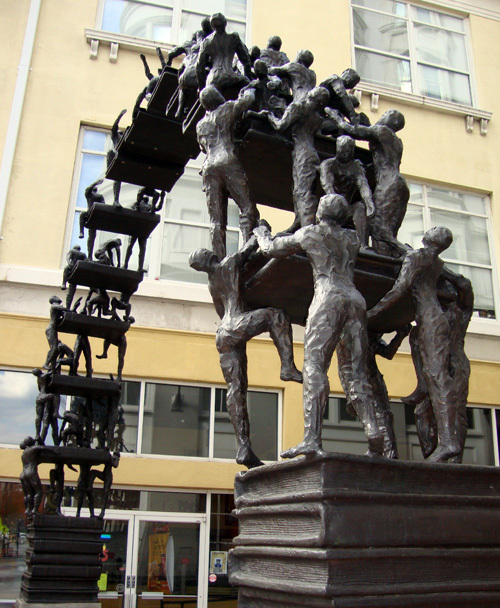 "Climb with Care and Confidence"
One of my favorite statues in Atlanta, for its unique design and subject matter, is the "Climb with Care and Confidence" sculpture—an arch fashioned of students and books. The bronze statue, dedicated during the city's beautification project just prior to the 1996 Centennial Olympic Games, marked $10,000,000 in scholarships contributed by Chick-fil-A, maker of probably the best chicken sandwich I've ever tasted. The statue is just off Peachtree Street in downtown Atlanta across from Woodruff Park. As well-known as its signature sandwich, Chick-fil-A's namesake football game held on New Year's Eve, the Chick-fil-A Bowl is also a city favorite. The game takes place in Georgia Dome and will be aired live on ESPN. Seems to me the more publicity, the more money for future scholarships! And maybe more statues.